Saw this in a charity shop and knew it had a home here. I’ve seen worse covers – I spend far too much time on here not to – but those weird elephant/fly/ram creatures are just too perfect. This is a real Mona Lisa of a cover, the eyes follow you around the room. Which one’s Alacrity and which is Hobart? “Why are our Moth-steeds flying so fast?”, asked Floyt. “They’re headed towards that giant cardigan!” responded his companion, with alacrity. 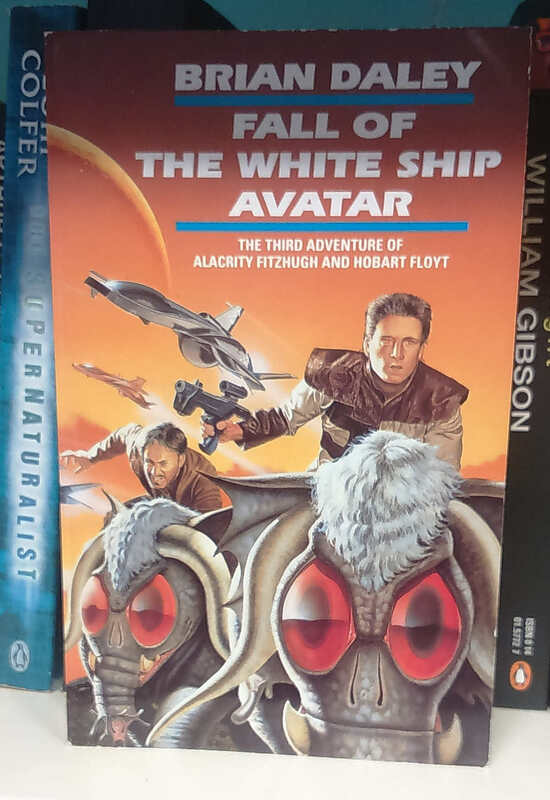 I like the fact they needed to signal that this is Sci-fi with the inclusion of a moon/planet hovering in the sky – you know, in case it was mistaken for the next lit-fic Booker prize contender. What’s the theme song of this cover? Yakety Yak? On the American cover the beasts are more like longhorn steers and the handgun is more like an umbrella! These boys just loves the funky animals. Still can’t touch the total awesomeness that is the cover of ‘The Doomfarers of Coramonde’ though. Surprised that cover hasn’t reached these shores. Won’t spoil it with a link. GOOGLE it if you wish. @fred – Beat ya to it. Alacrity! This was originally going to be the poster for ‘Young Guns IV’ – Emilio was on board but Kevin bailed and made ‘Waterworld’ instead. About the elephant-moths: There’s got to be some bat in the mix as well. I mean, look at the ears! And, you know, maybe even some woolly mammoth. On another note: What kind of a first name is “Alacrity”, anyway? I feel sorry for that guy. @Bibliomancer- I’ll give you this one, life intervened while I was in the middle of posting. Does fall pertain to a season, or is it a metaphor for age or a loss of standing? Is the ship colored white? Is it owned/piloted by White or a planet/corporation/faction named White/white? Is the ship named Avatar or is this a precursor to Andromeda avatar wise ? Is it even an intergalactic vessel and not a row boat? Are they wearing spurs? And Mr. Brian Daley did very well for himself in life afore he passed. Very well indeed. I wonder where this book falls in Moths Scale of Sci-fi Hardness? “Dang it Alacrity, I’m tired of riding in the sidecar, and I dropped my gun again! Ah, yes, Hobart Floyt. Composer of such famous ditties as Tark Site of the Wooloomooloo and Wish Darwin Were Hert. I assure you, the Snoodhouses are a fine old family and the name ‘Alacrity’ has been passed down for generations. I swear it on the grave of my mother Effervescence Matilda Snoodhouse. Why oh why do I let my obsessive side loose? I’ve spent hours now pondering this overwhelming question: Just what has fallen? 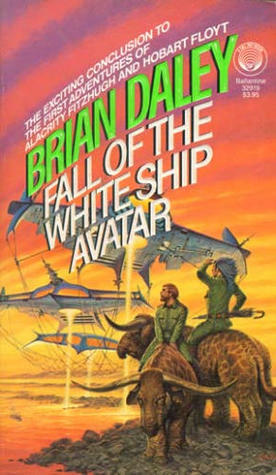 Is it a ship avatar that is white, or an avatar of a white ship, or a white ship that’s named “Avatar”? None of it makes any sense of course, but that doesn’t stop me. Looking at the background…what is a [PERNATURALIS], and where can I get one?